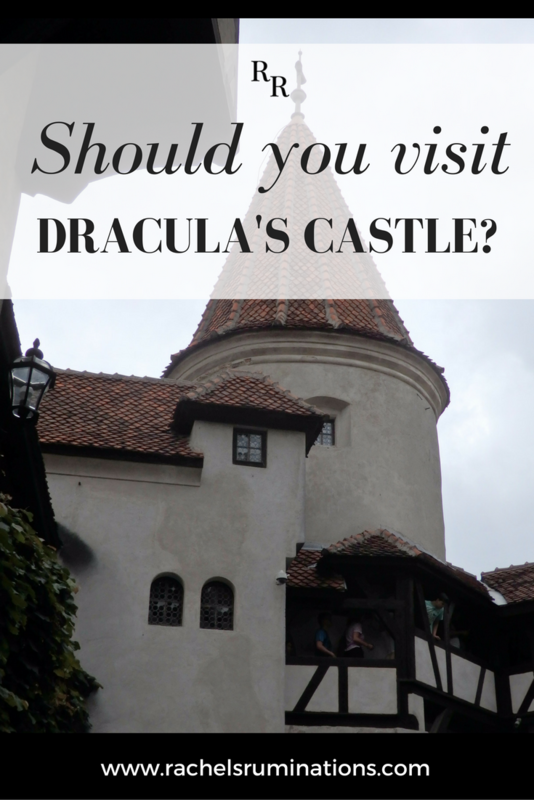 Should you visit Dracula’s castle? As the crowds shuffled through the castle, some tourists tried to stake out spots where they could take pictures of each room without people in the photo. Others posed for selfies, their backs to the beautifully restored spaces. One man, reaching high in an attempt to snap a picture above our heads, leaned casually on an antique buffet. The crowd slowed as visitors took turns peering into a small room at the end of a hallway. Waiting, a little girl, perhaps seven years old, reached out and opened an intricately carved antique cupboard. I think she was disappointed to find nothing but a modern feather duster inside. Closing it again, she decided to try the drawer below, grabbing the handle and tugging. The drawer wouldn’t open so she tugged harder, now with both hands, unconcerned with the value of the piece. Her father, right behind her, did and said nothing. Because he didn’t say anything, I did. I tried to keep my voice polite, telling her to stop touching the furniture. I have no idea whether she understood what I said, but at least she stopped. This is Bran Castle, world famous as Dracula’s castle – which it wasn’t really, but I’ll get to that later – and a very popular tourist attraction. In our two weeks driving around the northern half of Romania, we saw very few other tourists. In some places – including UNESCO World Heritage sites – we were greeted by locked gates with signs pinned to them: “Call this number and we will open the gate.” That’s how un-touristy most of our trip was. Except Bran Castle. When we visited, the town below the castle was overrun with cars and tour buses. Getting to the castle entrance involved passing through an entire marketplace overflowing with wares ranging from tacky souvenirs – pretty much everything with a vampire printed on it – to tasteful items like local crafts. After paying more than we paid for any other admission fee on this trip, we followed the crowds up to and into Dracula’s castle. 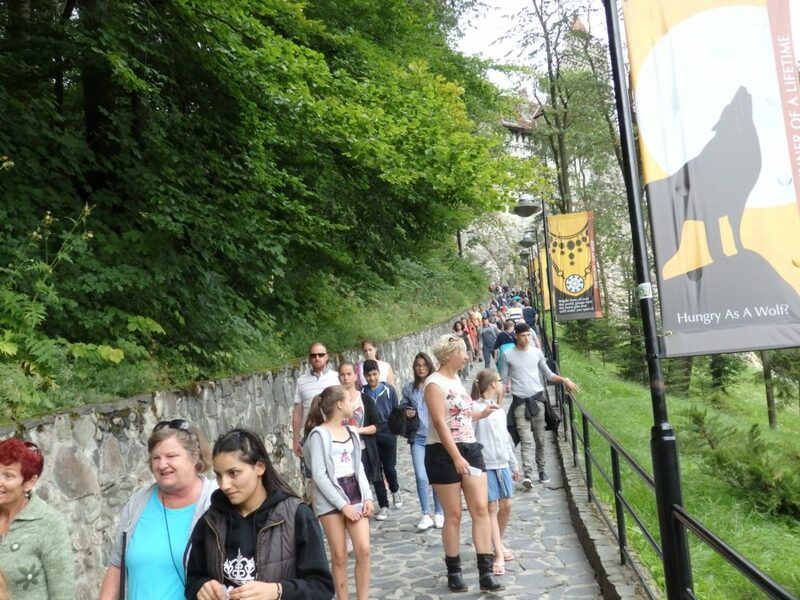 The path up towards Bran Castle, which you can see in the distance. Dracula is a fictional character. He was invented by Bram Stoker, an Irishman, who placed his 1897 story in the Carpathian Mountains in Romania, but never traveled there himself. Bran Castle, to some extent, fits Stoker’s description of Count Dracula’s castle: it stands on the edge of a cliff overlooking a river gorge. It’s not as dramatic as Stoker described though. Stoker may have based his character Count Dracula on the historical Vlad Țepeș. Also known as Vlad the Impaler or Vlad Dracul, he was a 15th century prince in Wallachia, in a different castle, now a ruin. Vlad Țepeș’s real-life connection to Bran Castle was its location at the entrance to a mountain pass on the trade route between his principality, Wallachia, and Transylvania. The current Bran Castle dates to the 14th century, when it was an important stop and customs post on this route. Apparently relations between Vlad Țepeș and the lords of Bran were not very friendly. The real Vlad Țepeș, returning from exile, invaded Wallachia with help from Hungarian troops. Saxons in Transylvania opposed him, and Vlad responded by attacking Saxon villages and taking prisoners back to Wallachia. There, he had them impaled on spikes. Later he was also responsible for the deaths of thousands of Ottoman Turks and Bulgarians. In 1462, Vlad Țepeș was captured by the Hungarian army and may or may not have been imprisoned in Bran Castle for two months before being moved elsewhere. People living in the area around Bran in the 15th-19th centuries believed in “undead” spirits that came out at night but were normal people during the day. It was, more recently, the home of Queen Mary of Romania and her family, and they spent a lot of time here from about 1930 on. Queen Mary was British: the daughter of Duke Alfred I of Edinburgh (son of Queen Victoria) and Grand Duchess Maria Alexandrovna of Russia (daughter of Russian Tsar Alexander II). She married Ferdinand von Hohenzollern, who was crown prince of Romania and later became King Ferdinand I. 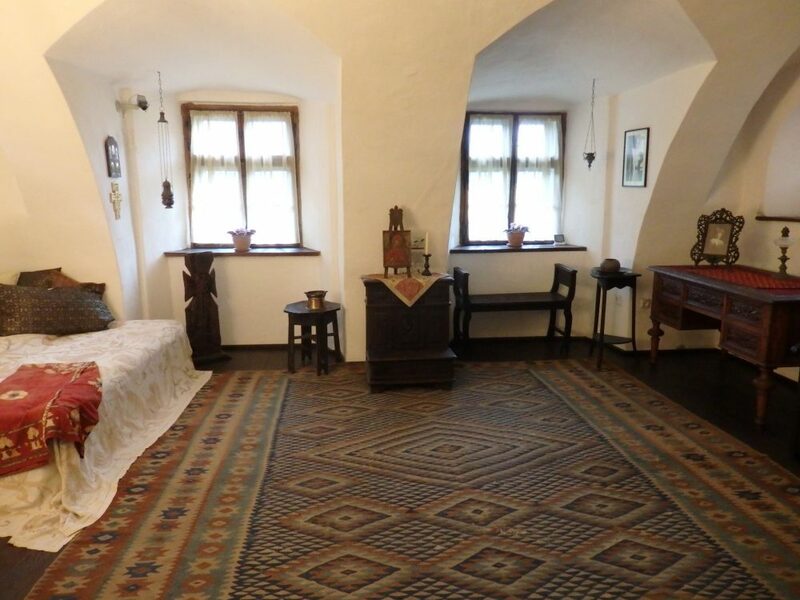 Taken away by the Communist government after World War II, Bran Castle was given back to the family in 2005. The castle still belongs to the Romanian royal family, which operates it as a museum. The rooms have been restored to look as they did in Queen Mary’s day, and when her adult children lived there after her death. The effect of this is that, despite the fact that the castle dates to the Middle Ages, and despite the crowds of tourists, it is easy to imagine actually living in this castle. Its rooms are charming and homely, not nearly as grand as I’ve come to expect in castles. It’s just too bad about the crowds, especially the damage they’re likely to do to the furnishings. It seems to me that, at least in the busy summer season, the management would do well to start imposing limits on the number of visitors. That depends. It is certainly a beautiful castle, and, just for that, I would say you should visit. However, don’t go during the summer tourist season, as we did. You’ll enjoy it more when the crowds are thinner. Don’t go just for the Dracula story because the links are just too tenuous. Romania Tourism’s website makes some suggestions for Dracula-themed travel that might better suit fans of the story. Some tours focus on the Dracula theme, so these might add to your fun. Details: About 45 minutes drive southwest from Brașov, Romania, or about 3.5 hours north of Bucharest. Opening hours: April-September Tues.-Sun. 9-6 and Mon. 12-6; October-March Tues.-Sun. 9-4 and Mon 12-4. Price: Adults 35 lei (€7.80). 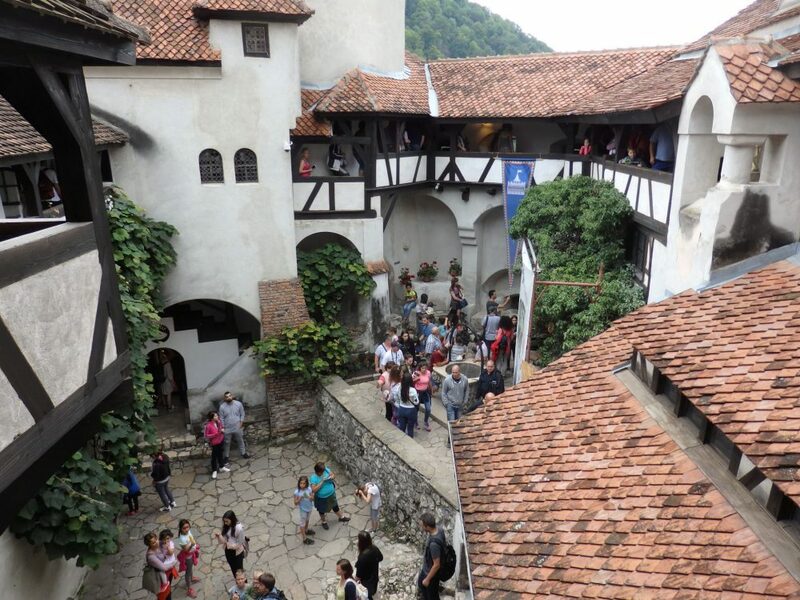 Have you been to Bran Castle? Have you read the original story? Leave a comment below! Thanks for the wonderful post, Rachel. I’ve not yet been to Romania, but would certainly enjoy a visit to Bran Castle. 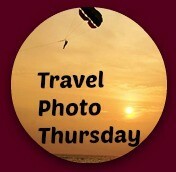 Thx for the great pics and story about it. There’s a lot more to see in Romania that the tourist hordes don’t seem to reach. I’ll be posting about some of them in the next few weeks! I enjoyed reading about the history of Bran Castle. That makes me want to visit it more than the Dracula reputation. It looks interesting. It’s a pretty castle, and I never knew before visiting it that the queen of Romania was English! We drove by Bran Castle last November, twice actually but had absolutely no desire to enter the castle itself. We did take a couple of outside pictures, one at dusk which looked nice and eerie and that was good enough for us. We had read about the amount of tourists there and the “expensive” admission fee when compared to other castles and we wanted no part of it. The town itself, or should I say the surrounding area was beautiful though and we did enjoy that. Yes, we loved Transylvania in general, and mostly felt like we were well off the beaten tourist path. You have convinced me. Even if you think the links to Count Dracula are too tenous, the castle itself sounds interesting and tenuous or not I am always a sucker for seeing places connected with famous books and films. Go for it! But try to visit outside of the summer busy season! I know! People just seem to think that their kids can do anything, or they themselves, for that matter. I’m not shy about pointing out destructive behavior. I tried throwing a glare at the father of this kid tugging on the antique furniture, but he carefully avoided catching my eye. He knew I was right, though, because he didn’t jump to the child’s defense. And I did speak to her in a fairly gentle way, so as not to scare her if she didn’t speak English. I find this very interesting. 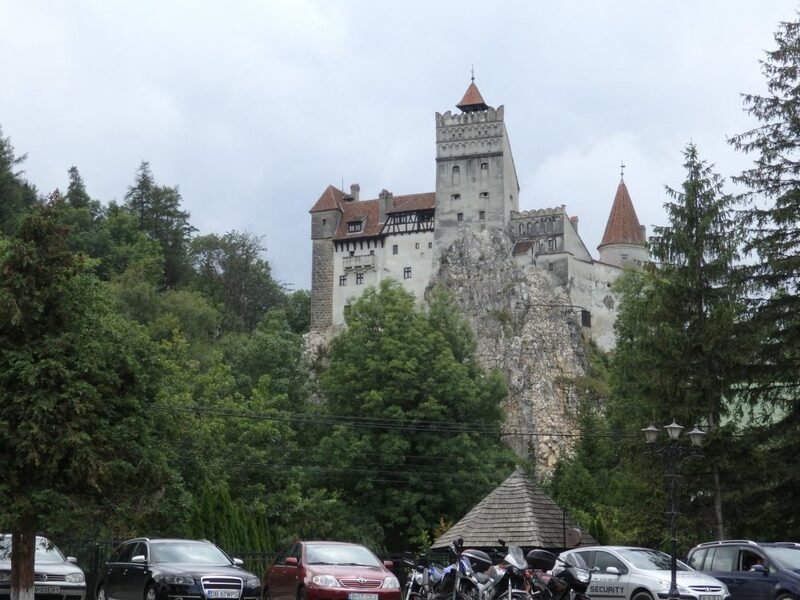 I would still very much enjoy visiting Bran Castle and think I will like the cozy feel of it, but it sure isn’t what I was expecting “Dracula’s Castle” to look like! As soon as I cross Romania off my bucket list I would hesitate to visit Bran Castle, Rachel. How many days are enough for staying there? One day would be plenty. The visit should only take about an hour, unless you decide to shop for souvenirs below the entrance. I did visit Bran Castle but it was several years ago and there were few tourists. But the tacky market was already there and doing a brisk business at the time. I thought it was a pretty castle and well worth touring. Too bad about the crowds now. I was there in July, and agree that the crowds really lessened the experience. I really did like the castle though, especially compared to Peles Castle which was next on our agenda. Even though the link to Dracula is tenuous, I’d still like to visit this place and imagine him walking the halls. It also looks very interesting in its own right, especially that pretty courtyard. It is very pretty! But go off-season!